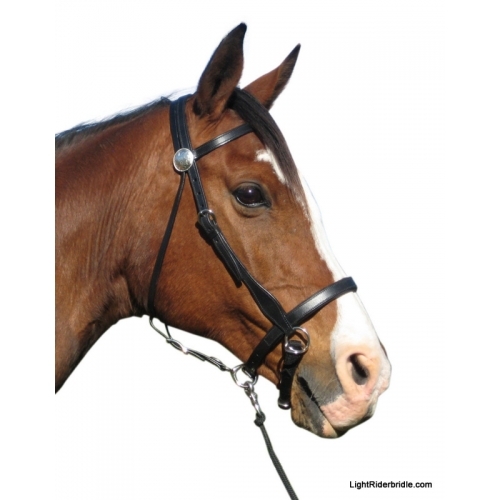 Urban Horse promotes an LightRider Leather Western Bitless Bridle. The LightRider Leather Western Bitless Bridle is available in Tan or Black Drum Dyed Leather. High Quality Drum Dyed Leather. Excellent Quality Drum Dyed Leather and Non-Rust Polished Stainless Steel Buckles. The LightRider Leather Western Bitless Bridle is ideal for western breeds, reining, cutting, shows, pleasure and trail horse riding. The LightRider Leather Western Bitless Bridle's soft webbing chin strap keeps the noseband from twisting to give clear and direct communication. This means you can use lighter rein aids. When rein pressure is applied the chinstrap becomes snug but does not over-tighten due to the type of webbing used. 90% of the pressure is on top of the nose, and the horse can self release the chinstrap easily for eating, yawning etc. The bridle can also be used as a sidepull by clipping the chinstrap and noseband rings together (recommended to start with if your horse hasn't experienced a chinstrap before). Connector strap with leading ring (can be removed if you don't need to lead or lunge). Urban Horse is the UK re-seller of the LightRider Bitless Bridles and Accessories. For any sizing questions or further information required please do not hesitate to contact us on sales@urbanhorse.com or by telephone 01434 422700. How is the LightRider Leather Western Bitless Bridle different to other bitless bridles? Clearer, lighter communication with better responses because your horse can listen without pain. It has a unique sliding chinstrap that stops at snug. So therefore is comfortable which creates a happier horse for a better riding relationship. 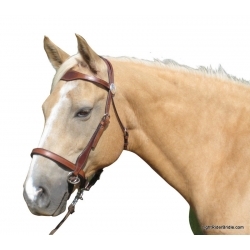 The LightRider Bitless Bridle is closer in design to a side-pull bitless than the cross-under style bitless bridles. Its unique sliding chinstrap provides the control and most importantly the release from pressure when you loosen the rein. The LightRider Bitless Bridle is also more comfortable than many bitless bridles as is has no tight straps, allowing the horse freedom to eat, drink and yawn without you having to undo anything. It converts quickly and easily to a halter for leading, lungeing, tailing and ground play. When you tighten the reins, the majority (approx. 95%) of the pressure is on the horse's nose. 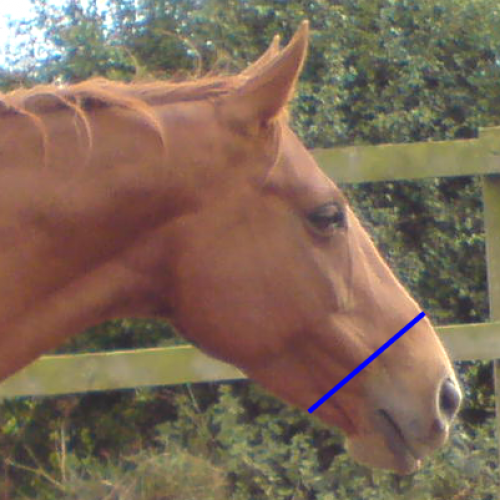 The chinstrap tightens to a point that keeps the noseband firmly in place. The particular webbing and the design used in the chinstrap stops it from over-tightening. You can feel for yourself by putting a finger under the noseband and another under the chinstrap then have someone pull on the reins at wither height.